It’s another Friday evening and the weather is about the slowest we get here. Nearly constant sunshine above 2,000′ and south or east of the Portland metro area for the next 5-7 days. Occasional low clouds will push onto the coastline and up the Columbia River from Longview to Portland. That’ll be mainly tomorrow morning and then again later next week. Here’s a nice view of the eastside low clouds this morning from our newly upgraded Skyline Camera. We finally installed an HD camera up there a few weeks ago and the view is much better. I would sure like a weather sensor up there before winter too…we’ll see. 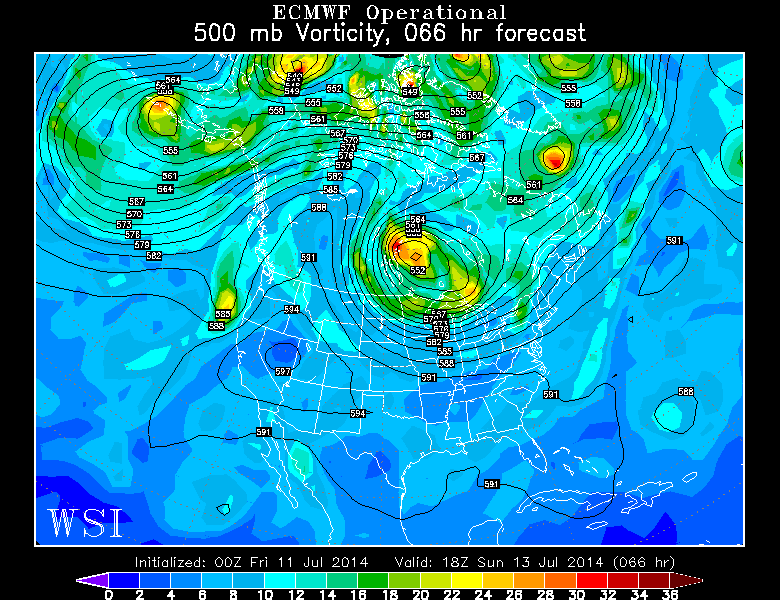 The reason for the slow weather in the upcoming week is a return of the upper level ridge in the Western USA. The center of the high will remain over Nevada or Southern Idaho, which means we won’t get a sharp thermal trough and offshore flow in the next week. As a result, high temperatures along the Columbia River from Longview to the Portland metro area won’t get much above 90 degrees. The warmest temperature we have on our 7 day forecast as of Friday evening is 92. 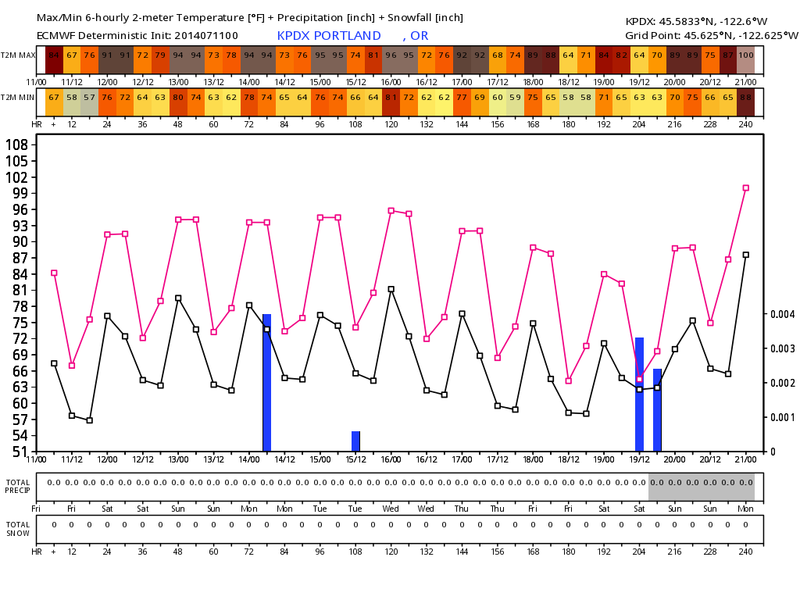 You can see the ECMWF model’s meteogram (over Portland) showing gradually rising temperatures through midweek then cooling late week. But if you live in Salem or farther south in western Oregon, farther removed from the marine air, high temps will make it into the mid 90s. 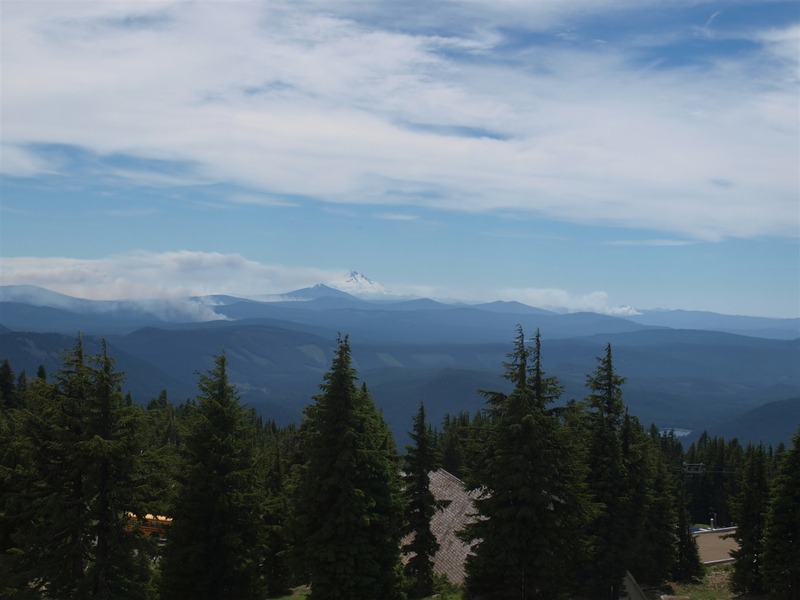 Of course east of the Cascades will be HOT. Sunday through the rest of next week will see high temps around 100-105 at the lowest elevations and 80s even high up in the mountains. This will be the 2nd heat wave of the summer over there. Enjoy the weekend and stay cool next week! Yacolt Burn Drops to #2, After 112 Years! The Yacolt Burn has been dethroned. News just came in this evening that the Carlton Complex Fire has now surpassed the size of the great Yacolt Burn of 1902. 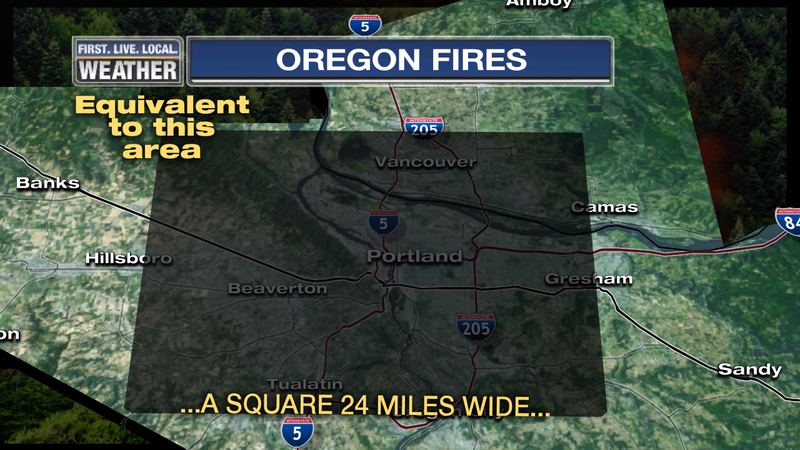 That was the fire that burned about 240,000 acres in just a day and a half during an east wind event. 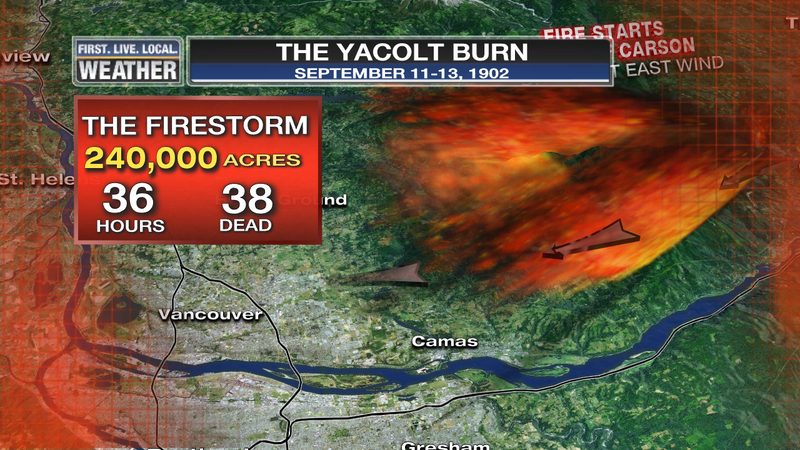 It started near Carson (in the Gorge) and ended up quite close to Yacolt and Battle Ground just 36 hours later. 243,000 acres is the current acreage of the complex up in northern Washington. The next 24 hours will see very active weather across the Pacific Northwest, unusual for what is typically the driest time of the year for our area. Increasing instability in the atmosphere ahead of an approaching cold front means showers pick up, especially after midnight west of the Cascades. There is even a chance of a thunderstorm or you could wake up to downpours. 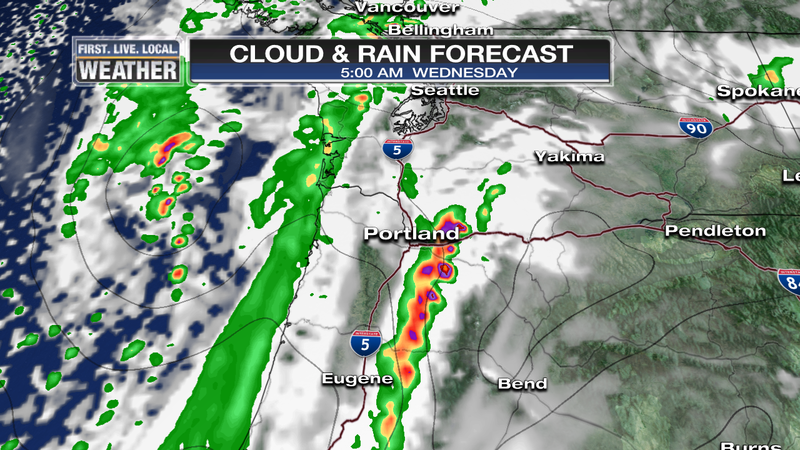 Our RPM model goes crazy showing a cluster of heavy showers/thunderstorms developing along the east side of the Willamette Valley in the wee hours of the morning. That may or may not happen, but the point is that we’re in moist southerly flow during the night. Think May…a cold front moves through in the mid morning hours with steady rain, possibly a thunderstorm embedded too. There could be some downpours during the morning commute. Then behind the front, from midday through evening, we’re in the cool and showery part of the system. That means showers, sunbreaks, southwest wind gusts to 30 mph, and a decent chance for hail or thunder with some of those showers. Of course this can also be the type of weather that can give us funnel clouds, so be on the lookout for rotation if you spot one. Total rainfall the next 36 hours? 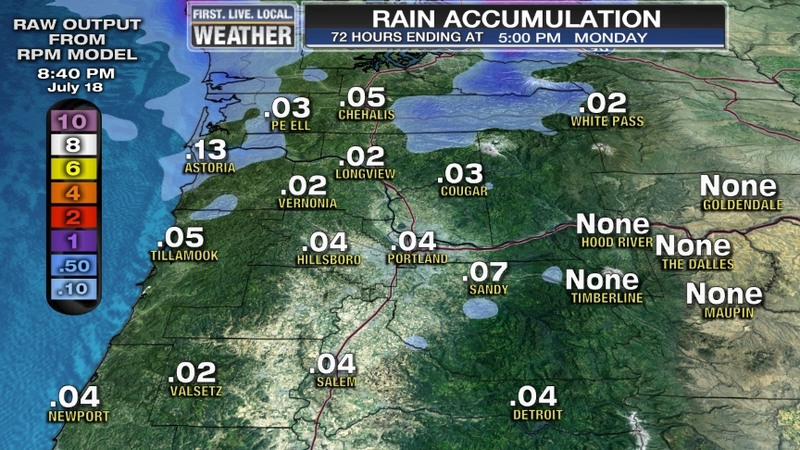 Somewhere between a quarter of an inch and one inch in the lowlands depending on where any heavy rain bands set up. Once again note our RPM going crazy with heavy totals on the east side of the valley. 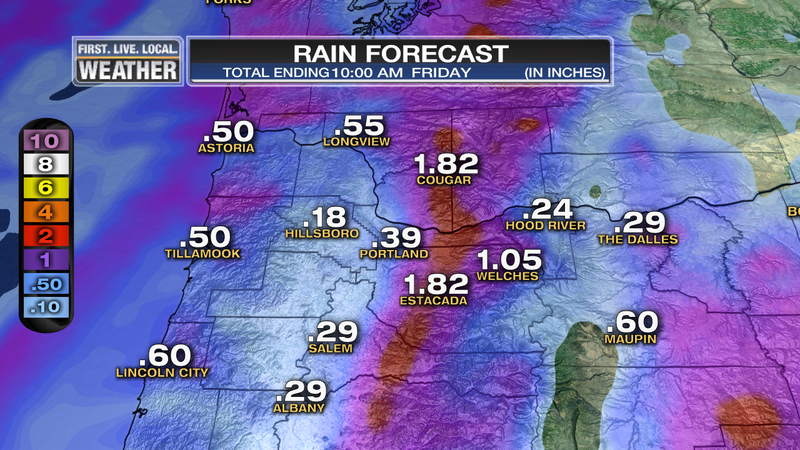 Probably misplaced, but the point is that someone is likely going to get a big soaking west of the Cascades. You may remember I posted back in early July a graph showing that the snowpack at one location (on Mt. Hood) has definitely not shown a tendency to melt any earlier. At least in the past 30+ years. It shows the average melt out date for 221 sites in the entire Pacific Northwest. Same pattern here, no sign of an earlier melt out in the Cascades we would expect in a warming climate. Interesting eh? Cliff has some thoughts on why that might be on his blog. I even see one west of the Cascade crest too. 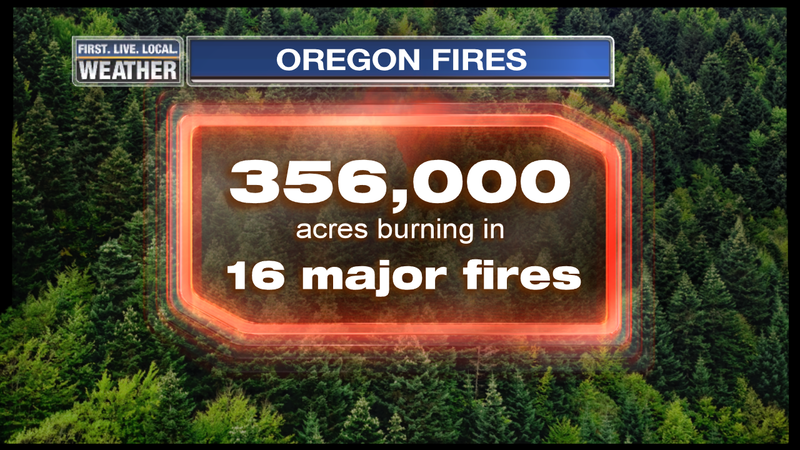 The fire stats are impressive, a third of a million acres have burned in the past week just here in Oregon! A large percentage of that is from the fast-moving range fire east of Burns. 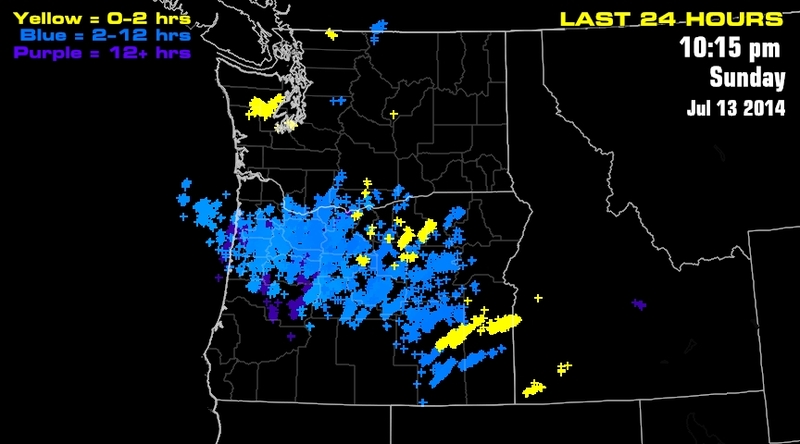 Put that on a map of the metro area and that would mean an area from Hillsboro to Gresham and Salmon Creek to Oregon City would be blackened! The big weather news this evening? What was going to be a pretty impressive heat wave is now down to just a couple more hot days. Tomorrow’s high temps, after morning clouds, stay mainly in the 80s or just barely touch 90…nothing unusual for mid July. Although it will be more humid than normal for mid July. Tuesday will likely be our warmest day with temps into the lower 90s, still not exactly a scorcher by July standards. Then a gradual cooldown the rest of the week. 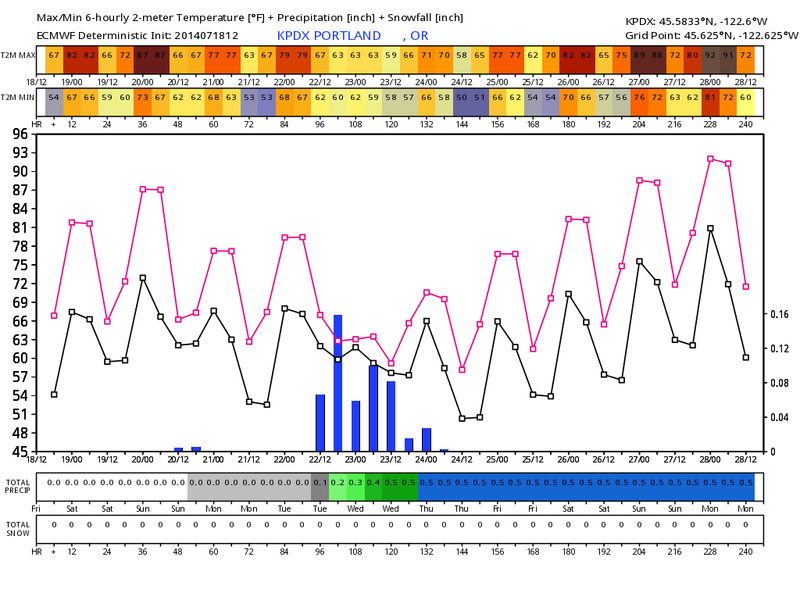 So no record high temps and it even appears the humidity may drop a bit Tuesday and Wednesday. Why the change from my post on Thursday? The upper-level ridging is slightly weaker than shown a few days ago, plus the orientation is such that we don’t get offshore (really hot) flow at any point. So basically the Pacific Ocean air conditioner is going to keep us from getting too hot. and then just the metro area. So stay cool this week, but the big picture is that this work week will only be a little warmer than last week; no big heatwave on the way. Our longest/hottest period of weather in 5 years begins this weekend and continues through at least the middle of next week. 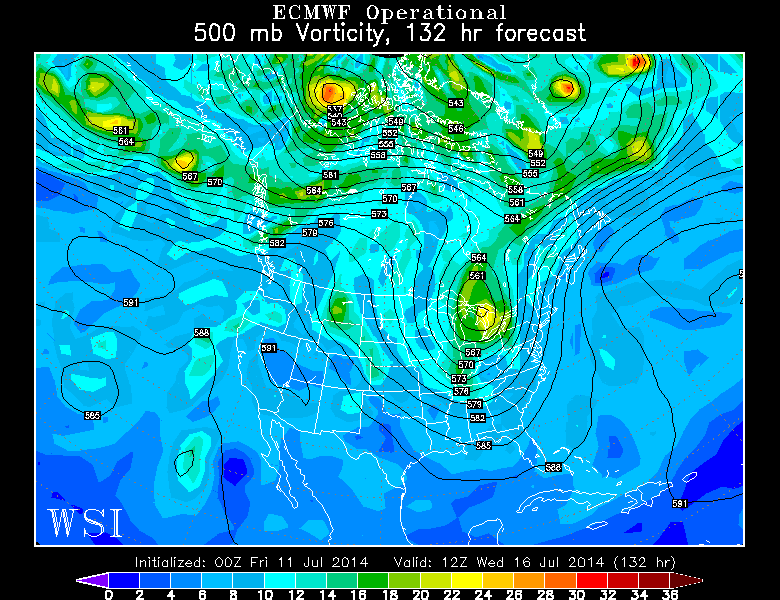 The weather maps and models all scream “get an air conditioner if you don’t have one!” . 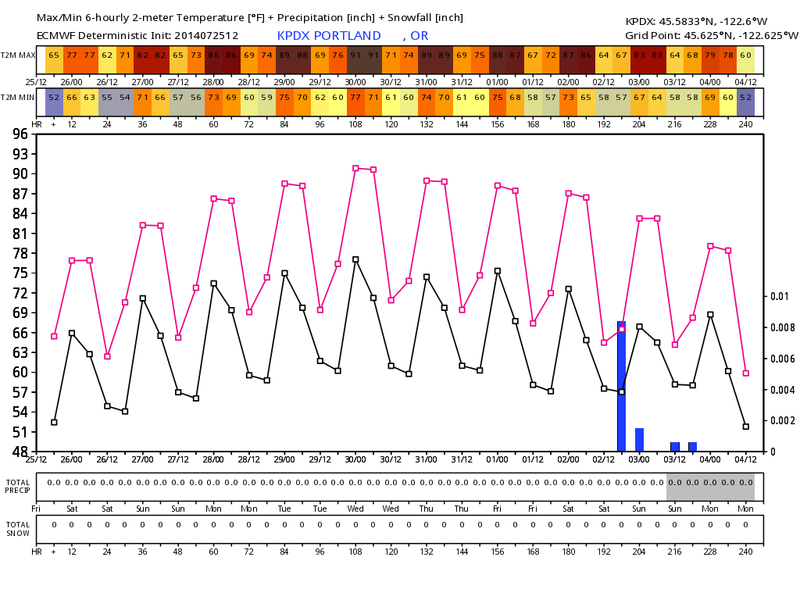 Hotter temps are likely (somewhere between 90-100) for Saturday through Wednesday. We haven’t seen a period like this since late July and early August 2009. Very high relative humidity/dewpoint levels mean unusually warm nights and sticky weather. 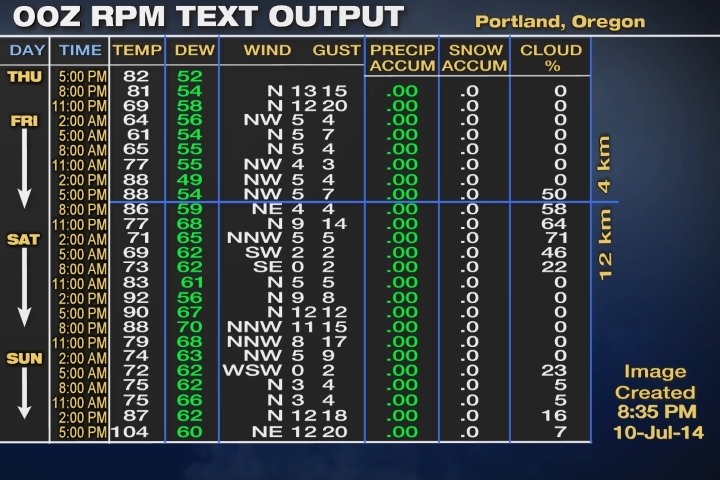 And I wouldn’t be surprised if we have at least one 70+ degree lows in Portland; a first since the 2009 heat wave. Thunderstorms are quite possible west of the Cascades during the period Sunday afternoon through early Monday morning. They will add moisture to the air at the same time a very hot atmosphere is over us. I’m still on vacation this week but figured I should chime in on the approaching hot weather. In one word…yuck for those without air conditioning. 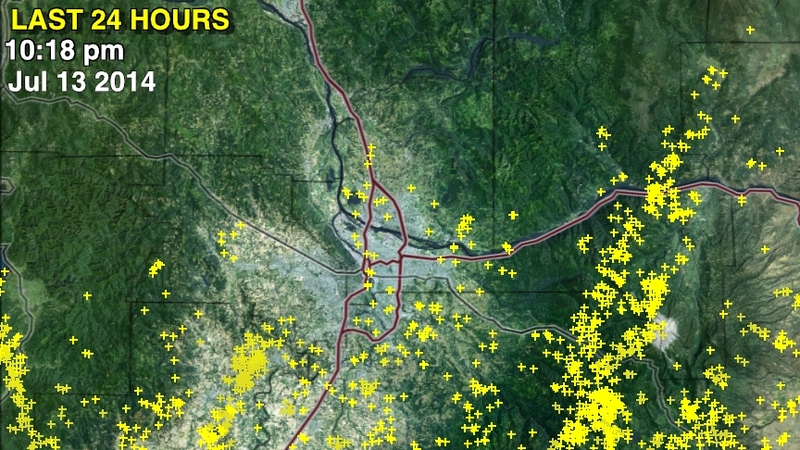 For meteorologists and weather geeks we have a good possibility of thunderstorm action (real summer storms, not the boring spring/fall ones), and some extreme temperatures. So I’m a bit torn since I feel bad for those that are going to be real cranky, tired, and overheated by midweek. Why so warm? An upper-level ridge retrogresses from the Rockies to right over Nevada tomorrow and Sunday, then just offshore by the middle of next week. 500mb maps for Sunday and again Wednesday Very high upper-level heights, but not a sharp ridge. More of a smothering of warm/hot air. Without sharp ridging we don’t get easterly flow/thermal trough over us for the extreme heat (103-107) and dry air. 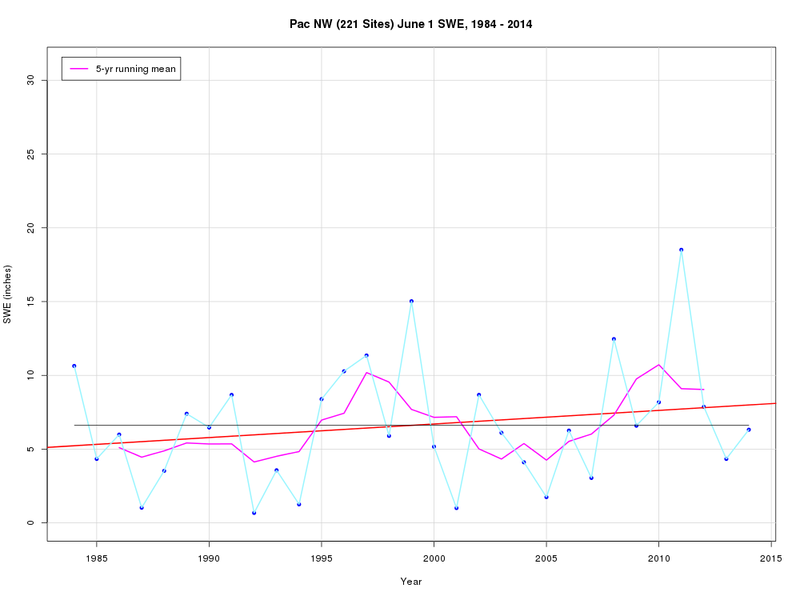 But we also see the cooling effects of the Pacific Ocean reduced to almost nothing with very little onshore flow. At some point later next week the ridging is centered far enough to the west that the airmass cools some and we get more onshore flow. Why so humid? Two reasons, first is that sea surface temperatures are running above average offshore along the north Oregon and Washington coastline, so dewpoints/humidity tends to be a few degrees/percent higher than normal this season anyway. The 2nd is thunderstorm moisture coming up from the south. You can already see it on satellite pictures this morning in southern Oregon; it’ll work its way northward for the next 3 days. Notice the midday Sunday map above shows an upper-level disturbance stuck on the west side of the ridge. It’ll move over us later in the day and early Monday. We’ll see how many thunderstorms it sets off. Could be a nice outbreak of storms during that period or just a few. But they will add moisture to the air. Cloud cover off/on the next 3 days will keep nights toasty too. Which day will be the hottest? Tough call due to cloud cover at times. I’m guessing it’ll be Sunday, Monday, or Tuesday. 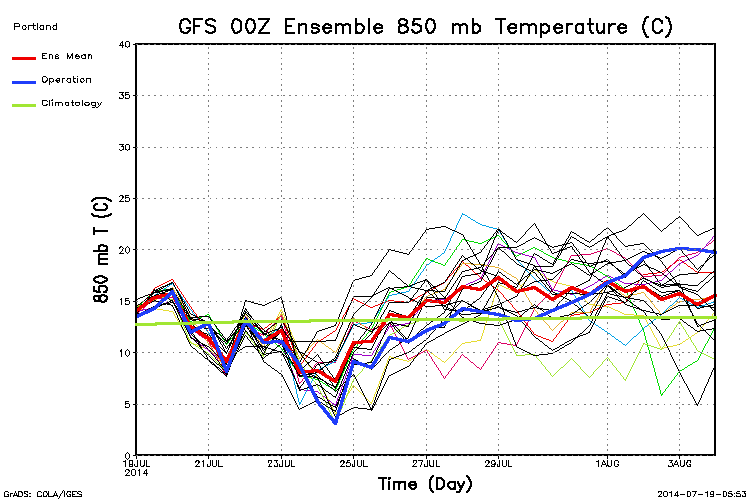 ECMWF has all of those days about the same but warmest Tuesday. WRF-GFS says Monday after a very warm night Sunday night with cloud cover and a few thunderstorms keeping temps up. Then skies clear out; perfect setup for a scorcher. Our 00z RPM last night showed low-mid 100s Sunday with very weak offshore flow that day ahead of the approaching upper-level disturbance. But sometimes it is all out by itself (and wrong), so I don’t put too much faith into it. Plus the new 12z only says 97 now with a lot more cloud cover. 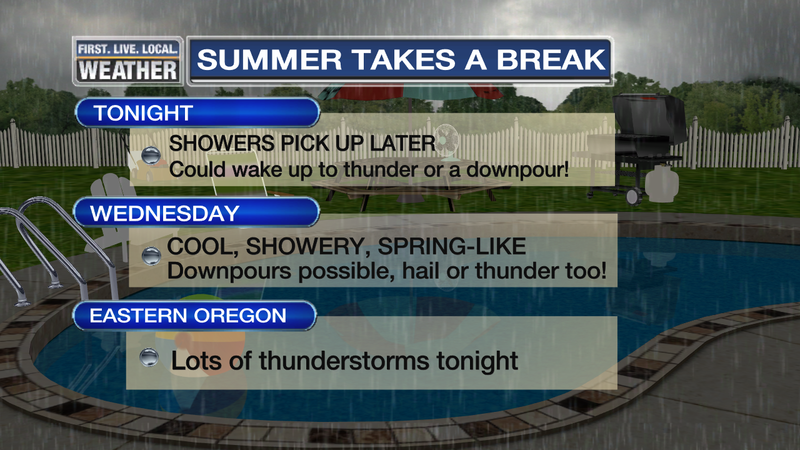 You are currently browsing the FOX 12 Weather Blog blog archives for July, 2014.